I am sad that there were no “Muppets” noms other than for Best Song. And furthermore, what’s with only 2 songs nominated?! Crazy. I fully support you watching “The Artist” asap. 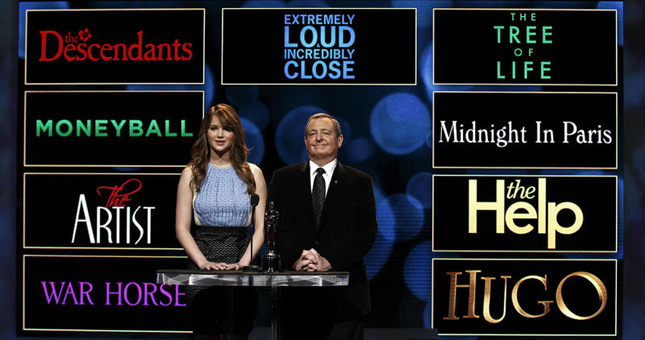 I’m totally torn between that one and “The Descendants” for my Best Picture vote. Yeah, it’s super weird that there’s only two for Original Song. Must be some weird rule like how you have to have ‘x’ number of animated films released to get more than three nominations for the Best Animated Feature category. Definitely The Artist and Extremely Loud are now at the top of my viewing list. I hope they bring back My Week With Marilyn here too. Seems to have some good performances in that one too. I think the thing you have to remember is that not everyone can vote for the Oscars. Sadly it’s only open to members of AMPAS. With any small group of people voting for something, what you get is a representation of they’re thinking . . . which sometimes doesn’t accurately represent a broad range of views or opinions. It’s probably a big reason why all the critics groups, guilds, and even the Hollywood Foreign Press all have their own awards . . . it’s because a lot of them aren’t represented in The Academy. It’s also another reason why we have blogs . . . so we can say who we thought was great. You’re definitely right though, it’s what we have so that’s the main reason why we tune in. Playing devil’s advocate here: are the Oscars becoming less prestigious, what with all the various other award ceremonies and much larger Best Picture categories in the past years? It is, of course, the highest honor in the business, but are average viewers becoming immune to happenings on the awards circuit? I would have to say no, the Oscars are still every bit as prestigious as we all make them out to be, even if we may disagree with them. And when you think about it that’s why I think people that disagree with the Oscars care about them the most . . . it’s because people think that the awards should go to winners that are more deserving. And also, I think average tv viewers and average moviegoers don’t pay attention at all to the other award honors from “not so high profile” groups.